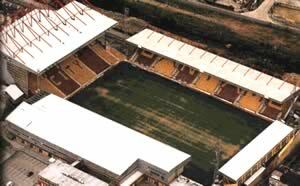 Nowadays, the Bradford & Bingley stand (formerly called 'Valley Parade') has a capacity of around 25,136, but in it's hay-day held a record attendance of 39,146. Visiting fans are usually allocated around 1800 tickets, and will find themselves located behind the goal in the Symphony stand (upper & lower tiers) and in part of the Ciba stand (along the side). We were allocated 3,600 tickets equally divided between the two stands. The symphony stand was described to us as 'adequate for away supporters, if a bit small'. It does mean you are close to the action, for a better overall view try to get seats in the upper tier. There has been much redevelopment at Valley parade, with a new stand behind the one goal, called the Carlsberg stand. The remaining side of the pitch is spanned by the Sunwin stand. This is an unusual stand, as it only covers three quarters of the length of the pitch. That said, they two stands are extremely impressive, it's just a pity the other quarter of the stand is made up of what can only be described as 'glorified portacabins'. There is a club shop located within the 'Sunwin' stand. Take the M606 all the way up. At the roundabout at the end of the M606 take the fifth exit onto Rooley Lane. Continue straight on at the next roundabout and then go left at the next into Wakefield Road. Go straight on at the next two roundabouts. Follow signs to City Centre A650. Follow signs for A650 through several sets of lights on the duel carriageway. Continue for two miles and then take a left into Station Road leading on to Valley Parade. Follow the A650 southbound past the Bankfield Hotel on the left into Saltaire. At the roundabout take the fourth exit on to Bradford Road. Continue straight on for two and a half miles, past the Cartwright Hotel on the left, to the lights. Turn left on to Queens Road, then take the next right down Midland Road. The ground is on your right. Follow the Leeds Old Road, the B6381 past the White Bear Pub on the left, then turn right at the lights onto the A6177. After a mile turn left into Northcote Road, just before the Save Petrol sign on the right. At the next junction follow the signs for A6177 (Ring road). Go straight on at the next junction and then turn left into Midland Road. The ground is on your right. Bradford Interchange, is about a mile from the stadium. Either catch a taxi, or a bus from outside the station. If you want to walk, go straight out of the main entrance and down the steps into Bridge Street. Go straight on at the crossroads, over Hall Ings and turn right at the next crossroads into Market Street. At the end of the road turn left by Barclays bank into Cheapside. This becomes Manor Row. Turn right down Hamm Strasse, towards Bradford Foster Square, then take the next left into Midland Road. The ground is up on your left. Bradford Forster Square is under a mile from the station. Walk diagonally across the car park to the main road. Turn right into Manor Row. Turn right down Hamm Strasse, towards Bradford Foster Square, then take the next left into Midland Road. The ground is up on your left. Buses numbers 622-626, 648-656, 677-680, 755, 811 and 812 run regularly to Valley Parade from outside the Bradford Interchange. Roads near the ground are residents-only parking. Midland road has around 200 spaces on it. Mannington Middle School on Mannington Lane also has spaces. There is also parking in the streets around the ground but be very careful about this choice as car break-ins are frequent. Supporters are advised to park in the town centre, and walk to the ground. This will take about 10 to 15 minutes. This pub is located in Manningham Lane, which is also very close to the ground. Try this pub if are looking for something a little different. This pub features gas lighting, and loads of real ales. Located on Westgate, and is a ten minutes to the ground. The Corn Dolly, Cartwright (...located at the ground) and the Oakleigh. If you are a registered user then you can login, and create your own personal review of Bradford City - Valley Parade. These reviews can be private or public.